College football is one of America’s most popular pass times, getting support from fellow students and alumni of the school, as well as new fans from younger generations. By using these games, colleges attract possible new students through the hype and rivalries between different schools. In this case the “War on I4” is a rivalry between two of Florida’s biggest universities, UCF and USF. The long history between the universities generated tons of hype and drew the eyes of fans from all around the Orlando and Tampa metropolitan areas. The teams have had great track records in previous seasons, with UCF going at an impressive 11-0 and with USF going 7-5 this season. But only one team could claim the I4 trophy. 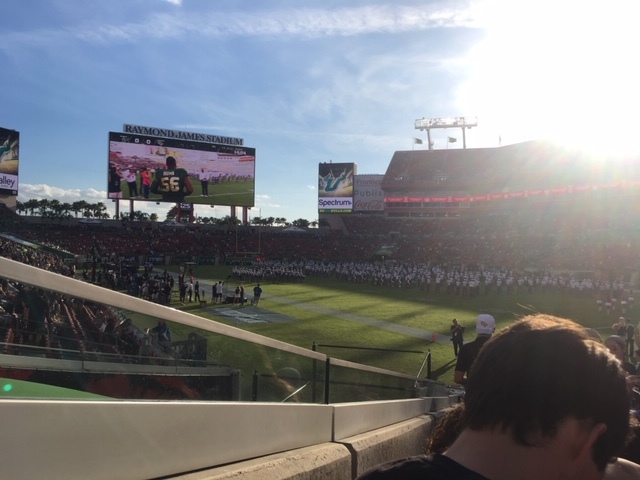 The stadium was packed full of fans from all over the metropolitan area coming to support their school, selling out almost all 65,618 seats in the Raymond James Stadium. In the first quarter there was an obvious struggle to get a strong lead, with each team going back and forth with the ball. For most of the quarter this constant loop kept happening with both teams refusing to give in, until finally UCF was able to push USF back far enough to squeeze in a touchdown in the final 30 seconds giving UCF the upper hand leaving the score at 7-0. UCF continued with the pressure not letting USF slack off for even a moment, closing in on their end zone. UCF suffered a tremendous loss when their star junior quarterback McKenzie Milton took a hit on leg causing serious damage removing him from the game. Milton had led his team to 23 straight victories in his two-year career with the Knights. The crowd game him support with loud shouts and cheers from the stands that help to reinvigorate the team. After some mild adjustments from the team UCF was able to push through the defense and score a 40-yard touchdown. In Milton’s absence came backup quarterback Darriel Mack, who helped the Knights score 30 or more points in their 24th straight game. Not everything was bleak for USF, they were able to outlast UCF in the final minutes of the quarter and scored a touchdown with their running back Johnny Ford. The first touchdown for the bulls finished up the quarter with a score of 17-10. Going into the third quarter the pressure and tension was building in the crowd as USF was trying to make their comeback, but UCF’s defense would not give in resisting them throughout most of the quarter. In the final 20 seconds UCF was able to rush past the defense and nail down a touchdown causing the crowd to explode in cheer with chaotic roars of support. At the end of the quarter UCF solidified their lead and halted the advance from USF. The score had come out to 24-10 at the end of the quarter. Rounding out the end of the game in the fourth corner was UCF pouring on an intense offense that widen the gap in the score to a total of 38-10. In addition to their tough offense, UCFs defense was strong enough to push back against any last-ditch efforts from USFs own offense. After claiming the I4 trophy UCF then sets their sights on their next huge game. Heupel was right about the importance of the game to the many fans and students of UCF. The fans had nothing but overflowing support for McKenzie and showed their school spirit out in the stands by encouraging the team every step of the way. The War on I4 was a great game that promoted school spirit and ignited passion into new potential students looking to attend their schools.